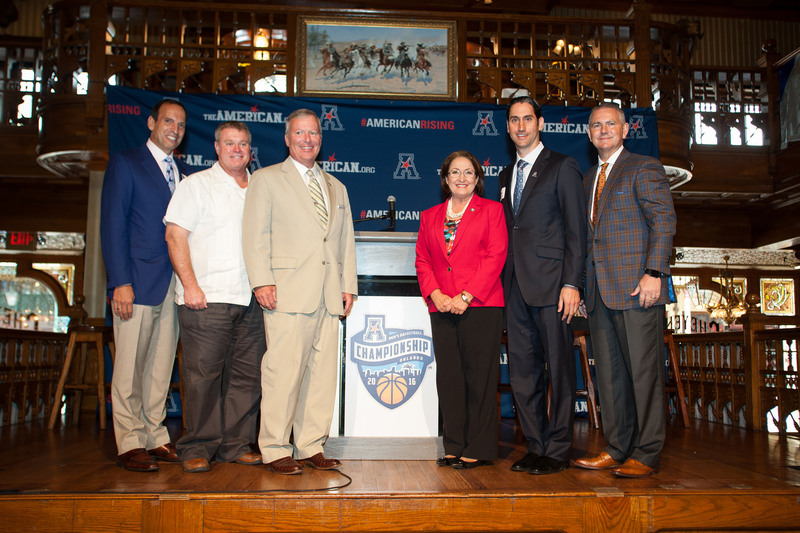 Orange County Mayor Teresa Jacobs joined community leaders at the historic Cheyenne Saloon in downtown Orlando on July 16 to launch the Local Organizing Committee for the American Athletic Conference Men’s Basketball Championship. The Conference will be held at the Amway Center March 10-13, 2016. The Committee, which Mayor Jacobs co-chairs with City of Orlando Mayor Buddy Dyer, will assist in raising awareness and garnering enthusiasm to help fill the arena by promoting the upcoming championship. “The American Athletic Conference Men’s Basketball Championship is a perfect example of the type of event we want to host,” said Mayor Jacobs about the upcoming championship, which is expected to generate approximately 5,000 room nights and more than $5 million of economic impact in Orange County. Aside from the dollars the championship will generate, it will also provide the University of Central Florida’s Men’s Basketball team the opportunity to play in their own backyard. “We want to see UCF’s fans out here in droves at the Amway Center to cheer on their home team,” Mayor Jacobs said. By hosting marquee sports events such as the American Athletic Conference Men’s Basketball Championship at the Amway Center, Orange County has the opportunity to again showcase the region’s arts, sports and family entertainment venues. The Amway Center also hosted previous marquee basketball events, including the 2014 NCAA Men’s Basketball Championships and the 2012 NBA All-Star Game. In April, the region became the No. 1 global destination with Visit Orlando’s momentous announcement of 62 million guests visiting in 2014. Citizens interested in attending the championship event may sign up to receive pre-sale information about tickets and travel packages before ticket sales open to the general public. Photos from the American Athletic Conference Championship event are available on Flickr for use by the media.